April 12 – Atletico Madrid’s notoriously controversial Spanish international striker Diego Costa has been banned for no fewer than eight games for a foul-mouthed rant against a referee. 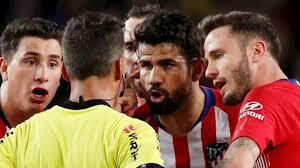 Costa, who rejoined Atletico from Chelsea in 2018, was found guilty of insulting Jesus Gil Manzano during his side’s 2-0 loss to Barcelona. Manzano’s match report from the La Liga fixture on April 6 said he had sent off Costa for reportedly using a Spanish phrase that referred to defecating on his “whore mother”. The suspension, handed down by the Spanish Football Federation, rules the 30-year-old Costa out of Atletico’s remaining domestic league games this season and one game next season. Manzano’s report further stated the 30-year-old striker swore and shouted, and grabbed him “on numerous occasions” after he had been dismissed. The club has 10 days in which to lodge an appeal. The ban is the biggest in Spanish football since Pepe was hit with a 10-match punishment in 2009.